These two kits will service all Twist-Grip™ assemblies on Evinrude® and Johnson® outboard models. All Models - Check the length of the helix halves being replaced. If the new helix halves are shorter than the original helix halves, install the spacer (8) over the stop switch wire and against the stop switch. Use only parts supplied in each kit. Do not substitute older parts, failure to use parts supplied in each kit as an assembly would cause throttle cable system failure. 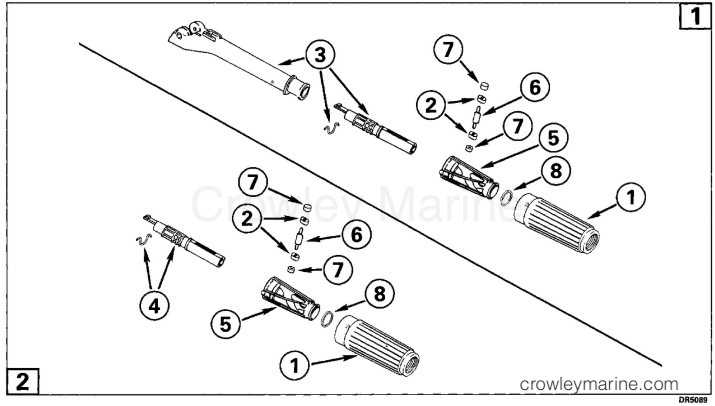 Refer to the Service Manual for installation of each kit.